Thoughts, reviews & musings about stuff that resonates. Former Prisoners bassist Allan Crockford returns with third of album of softly psychedelic Britpop. As bass player for The Prisoners, Allan Crockford's influence on British guitar music is assured. That the band never went on to mainstream success remains a mystery, but their legacy resonates still. And of course there are many ways to measure success, one being how much enthusiasm and desire one maintains to carry on making music. With this in mind you could say Allan Crockford and Prisoners' guitarist Graham Day are two of the most successful musicians around, though I doubt you'd recognize them on the street. And getting papped is probably not an issue for them. As Graham Day & The Forefathers they've just released a storming debut single (read about it here). Crockford is a busy chap – along with bass-playing for the Forefathers, he's the main writer, vocalist and guitarist in his own band The Galileo 7, whose third long-player False Memory Lane has recently been released. Compared to The Forefathers material it's a record that's less about sonic attack, more about melody and harmony. It's altogether softer on the ear, subtler, though no less appealing. A satisfying blend of Medway mod, Britpop and home counties soft psychedelia, its key comparisons would be XTC, Martin Newell, and the much underrated Dodgy. With a catchy set of tunes, (driven by the sort of melodies Noel Gallagher would love to have written), plenty of bah-bah-bahs in the backing vocals, acoustic textures and vintage Mellotron upping the soft-psych quota, it's one of the summer's best under-the-radar releases. It's worth noting the Medway towns are something of an anomaly, being out of step with the home counties general air of respectability and conformity. Rather than the Good Life's Margot and Jerry, its population is seemingly made up of vintage guitar wielding, retrogressive garage rockers intent on trying to recreate authentic '60s beat recordings. Sounds like heaven on earth doesn't it. Perhaps it's this desire to recreate that's behind the album's title. False Memory Lane would certainly be an apt street name for Rochester or Chatham. Town planners, you can have that one on Allan Crockford. The campaign starts here. 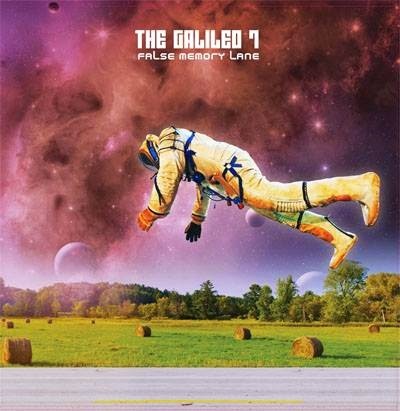 Click here for The Galileo 7's website.